A solitary bell rang from a high white tower as dawn crept over the city of Dol Amroth. 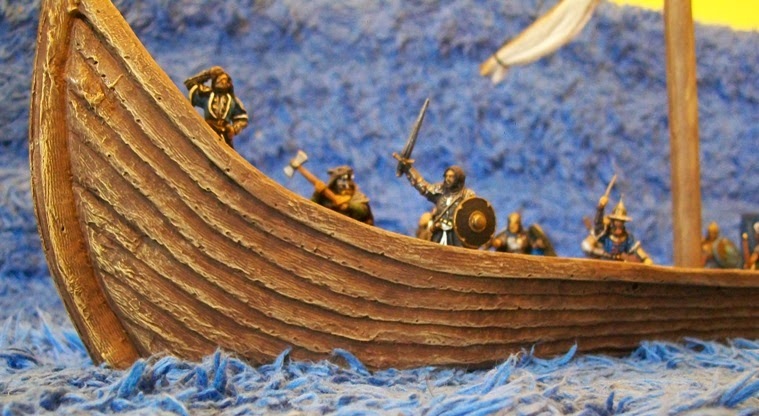 Down in the harbour, the long, sleek warship known as the Glaurung slowly rowed out to sea. After the festivities of the night before, the city had slept late, and only a few, quiet folk had come down to see the ship off. Once free of the harbour, the ship dropped its sail and used the gentle breeze to carry it slowly along the coast, past the numerous settlements that dotted the coastal road. Apparently word of the voyage had proceeded them, for hundreds of people lined the shores near these towns and villages, waving flags, blowing trumpets, and waving wildly to the adventuring heroes. Most of the voyagers paid little attention to the fanfare, but Darcarven often stepped upon the bow and waved his red scarf in appreciation. That evening, after covering approximately 65 miles, the ship pulled into a quiet cove near the village of Yenth. Most of the crew went off to the village where warm beds were found for them. The next morning, the ship once again put out, running with the morning light. They passed more villages, though most of these were quiet. In the early afternoon, Nereth turned the ship away from the land, heading for the island of Tolfalas, which could just be glimpsed as a thin line along the horizon. Luck was with the adventurers in their crossing, and the weather stayed fair, with a gentle breeze at their back. 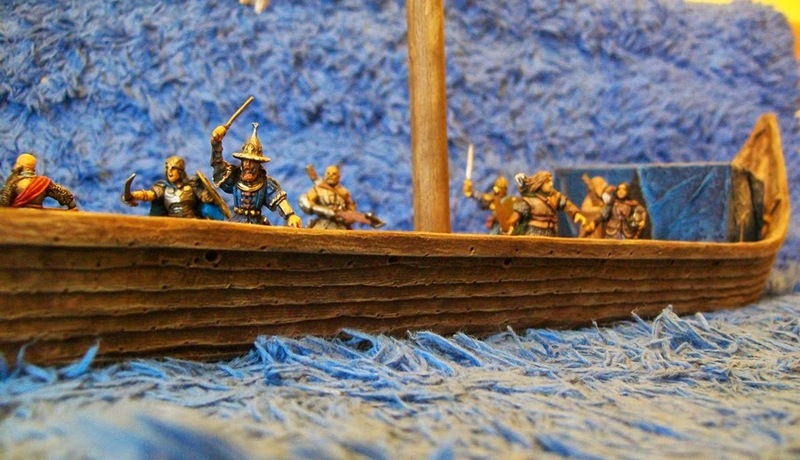 As late afternoon approached, they could see the harbour walls of Tolfalas, lined with guards and flapping banners. This was an island constantly under threat. Today, however, it was celebrating, for a beloved son was coming home. 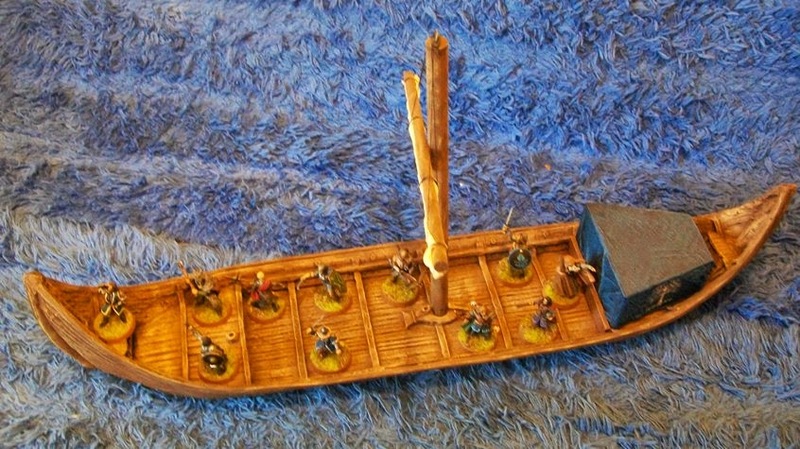 Althérion, the Sea Prince, and member of the crew of the Glaurung was the first to step ashore. Once again the crew were invited to a great feast in their honour. More songs were sung and tales of valour told. Wine flowed freely, though most of the crew of the Glaurung drank sparingly. Rymond, who sat at the table next to Lady Valetha, watched intently the interaction between Althérion and his father and older brother. ‘There will be trouble here one day,’ he said with a frown. Valetha turned her dark eyes to him, but said nothing. While the feast continued into the early hours, Breged made sure that all of his crew left in time to sleep well before the morning. Over the next three days, the Glaurung slowly turned south, passing through small islands, a few of which contained Gondorian settlements. Away to their left, the sandy expanse of the Haradwaith sat quiet and empty. 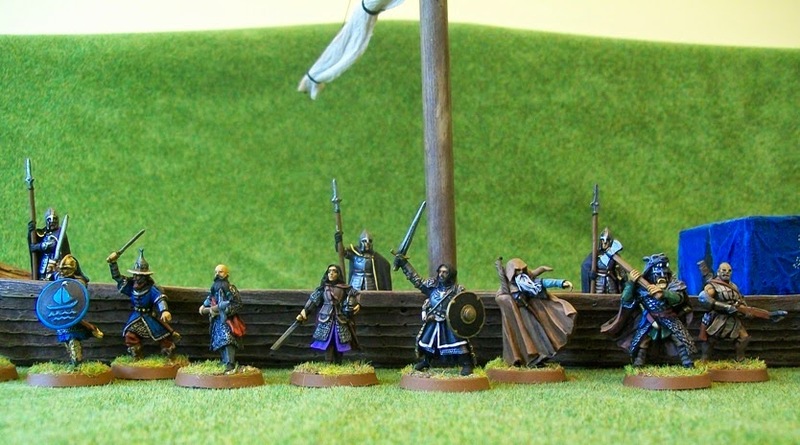 As night began to close in on the fifth day of their voyage, the ship rounded an island and came in sight of the Wenlack fishing station, the most southern outpost of the kingdom of Gondor. I manage to play my first little game with the crew of the Glaurung, which I hope to share in the next few days. First, though, the crew had to cover some ground. So, I took a few shots of the ship at sea. The ‘sea’ here is actually my bath mat, but it works pretty well, even has some waves in it. I didn't even try to put all thirty crew members in the ship. Instead, only the actual heroes are visible. 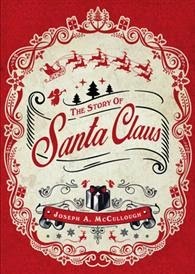 The Story of Santa Claus for £0.99! 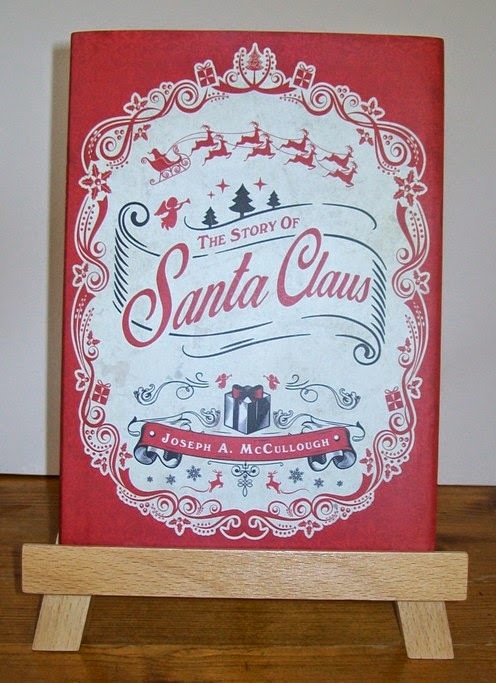 For those in the UK who might be interested in reading my book The Story of Santa Claus, it is currently selling for £0.99 on the UK Kindle store. The sale has propelled the book to number 1 on Amazon UK’s Holidays & Celebration list, just edging out Thailand: Deadly Destination. For those who missed my earlier post about the book, you can read more about it and see some photos of the book here. It's now less than a month to Christmas, so if you haven't gotten Mom a present yet, perhaps a cute little book full of Christmas cheer? Last week, with the baby asleep, and Mom on her first night-out in five months, I got to sit down and watch the Extended Edition of The Desolation of Smaug that has been sitting on my shelf, taunting me with its unbroken shrink wrap. For those who have seen the movie, but don’t want to invest either the time or the money in this edition, I thought I might briefly review the major differences. Although there are lots of little bits in the EE which differ from the theatrical release, there are three that I would consider ‘important’. The first of these is Gandalf’s introduction of the dwarves to Beorn. This is one of the real highlights of the book, but, much to my disappointment, didn’t appear in the movie. 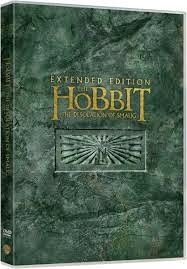 The EE edition includes the scene, although it sets it after the dwarves spend a night in the house. (Beorn only appearing the next morning). The scene is actually a great comedy piece, with the dwarves repeatedly mistaking Gandalf’s ‘signal’ and appearing before he is ready. Unfortunately, there is just something a bit off about Beorn in the scene. In a series that has constantly had to deal with making people appear different sizes, this seems to be the worst example. He just doesn’t quite seem ‘there’. Also, his acting isn’t quite as good as it is in the scenes included in the regular edition. Having watched the scene and somewhat enjoyed it, I actually agree with the decision to cut the scene from the regular release. There is also a short conversation between Beorn and Gandalf about Dol Guldur, which I think should have been left in as it gives a little more reason for Gandalf leaving the Dwarves at Mirkwood. It is in Mirkwood where we get the second major extension, and the reinstatement of another lost piece of the book. Basically, we get several more minutes of Thorin’s company wandering in the confusing woods, including the crossing of an enchanted stream with a collapsed bridge. During the crossing over some twisted vines, Bombur falls in the water and into an enchanted sleep, forcing the rest of the party to carry him. This scene adds nothing to the overall plot, but it is fun, is in the book, and makes Mirkwood feel more like the great wood that it is – they cross so quickly in the regular edition that it makes it seem like a very small forest. The last, and biggest, change from the regular edition is the inclusion of a new character, Thrain, father of Thorin. Thrain is briefly seen in the flashbacks in the first movie. We actually get some new flashbacks right at the beginning of the EE when Gandalf is talking to Thorin in Bree. (This also includes Gandalf asking Thorin about Thrains ‘ring’ – nice to see Gandalf doing his job). 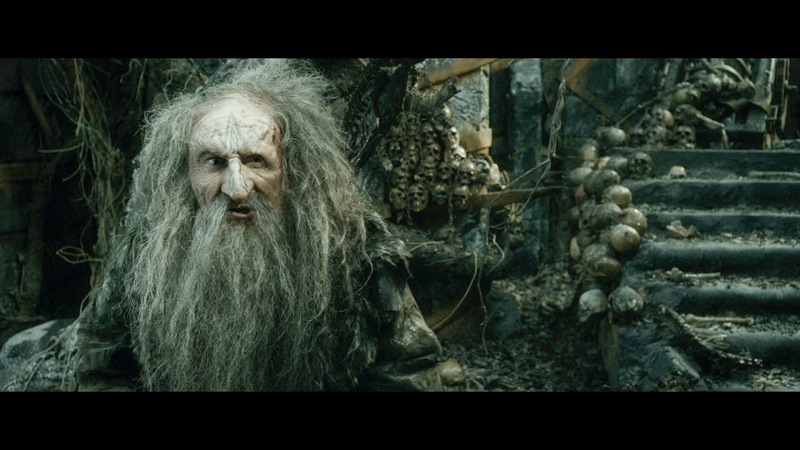 Later in the EE, when Gandalf is exploring the ruins of Dol Guldur, a crazy, emaciated version of Thrain attacks him. This is an odd scene, as for a moment, Gandalf feels hunted, only to be jumped by a really unthreatening old man. I think this scene is an attempt to work back in an element from the book – Gandalf meeting Thrain in the dungeons of Dol Guldur. However, in the book that event happens before the events of the Hobbit (though it is told later). Here it seems strangely out of place. 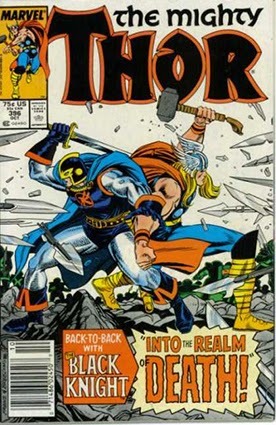 In fact, it is so out of place, that the writers obviously didn’t know what to do with Thrain and have him quickly dispatched by the Necromancers for no particular reason. It’s all a bit strange really. Peter Jackson and crew, however, must have realized the scene didn’t work and removed it. It is fascinating to see how they managed to completely remove the character from the scene. I think in some instances they must have digitally removed him from specific shots that made it into the final cut of the theatrical release. So, all and all, while the EE is fun to watch, it probably isn’t as good of a film as the theatrical release, with only the Mirkwood scene and a few tiny bits of pieces that might have added to it. Although The Hobbit: The Battle of the Five Armies isn't due out for another couple of weeks, Peter Jackson has already composed his goodbye to the fantastic world of Middle-Earth. In case you missed it, I've embedded it below. It's sung by Billy Boyd, who played Pippin in The Lord of the Rings and gave us one of the great moments in the trilogy when he sang his song to Denethor in The Return of the King. It's a melancholy song, no doubt, but that is certainly fitting with Middle-Earth. In fact, I think many people will perhaps be surprised by how sad the final installment of The Hobbit is likely to be. Personally, I'm looking forward to it. While I've enjoyed the first two installments, I think they have lacked some of the real emotional moments that drove The Lord of The Rings forward. 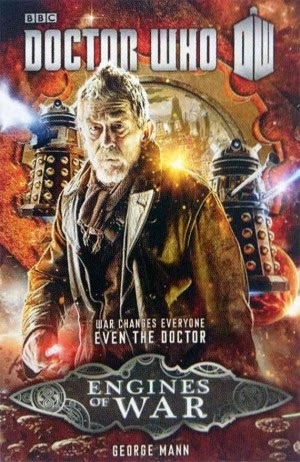 For those who haven’t seen the two-part, Doctor Who season-ending finale, I have just one spoiler – it’s garbage. I mean it is really nonsensical trash. I’d love to talk about the plot holes, but frankly, it’s more hole than plot. Now, one might argue that Doctor Who has pretty much been nonsense for a while, and I think there is some truth to that. 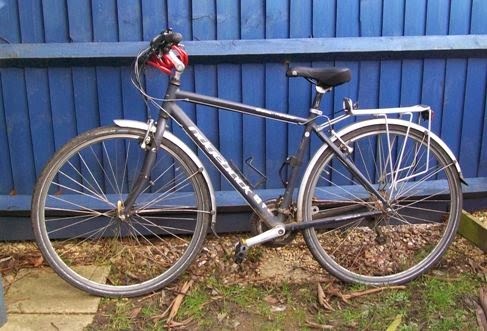 However, in the past, I was able to forgive a good bit of lack-logic because at least I enjoyed the ride. While Matt Smith was the Doctor, his episodes bounced along with a manic glee, led by a Doctor with a large heart. While this episode moved along with the same speed, it proceeded by bouncing from one distasteful point to another, led by a Doctor who seemed annoyed to be caught up in the whole affair. If I wasn’t such a large fan of the series, I probably would have turned it off. So, I fear I must join the growing ranks of fans who think it is time for Steven Moffat to step aside and give someone else a chance with Doctor Who. 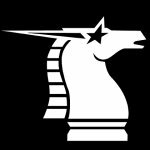 The last couple of months have been very exciting times behind the scenes at North Star. 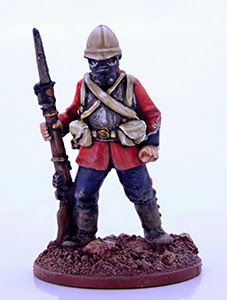 The next Osprey/ North Star project is a real Allied Forces affair, a combined effort from the hobbys best designers, Mike Owen, Mark Sims, Mark Copplestone, Nick Collier and Bob Naismith, bringing you quite a unique collection of figures for Osprey's 2015 game. 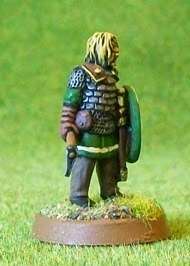 We'll start to show the miniatures off soon, just so you know, this is one for the Fantasy gamers. I announced earlier about how exciting the next Osprey project is for us at North Star as it is a fantastic collaboration between five great designers, all of whom are good chums of ours. 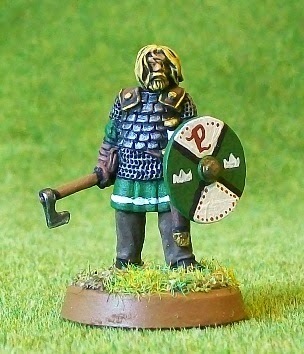 What I didn't mention is that for the first time, we will be producing some of the range in plastic. And what I also didn't mention is that we are not just working alongside Osprey on this one, it is a true joint project, Osprey's first figure range. More details to come. More news when I get it! 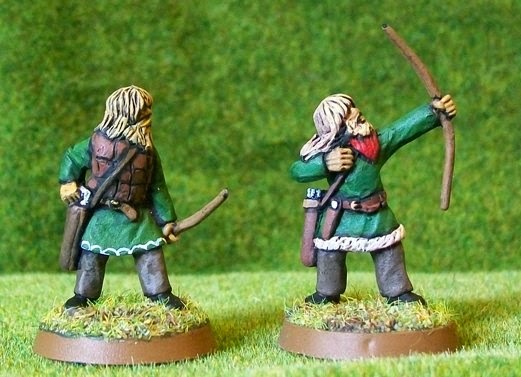 A trio of Dwarf Rangers that I painted up this weekend. 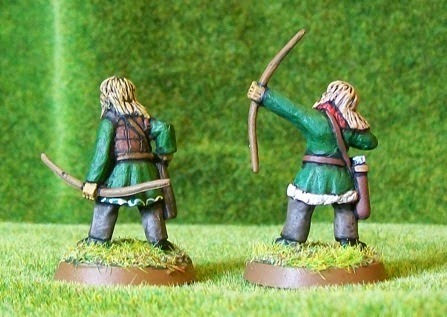 I think these little plastic figures are some of my favourite models in The Lord of the Rings line. There is just something very Tolkienesque about them. 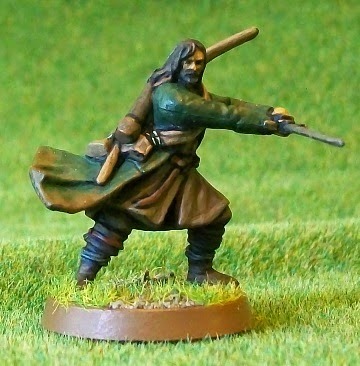 I have heard some people claim that they are supposed to represent Thorin's company (before the new Hobbit movie and before Games Workshop technically had the rights to depict those characters), but I can't see any specific evidence to back such a statement. 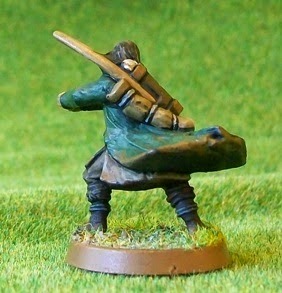 Regardless, they are some great miniatures. I’ve only been on The Pledge for the last month and a half, but already I’ve seen a shift in my thinking about the ‘cost’ of miniatures. 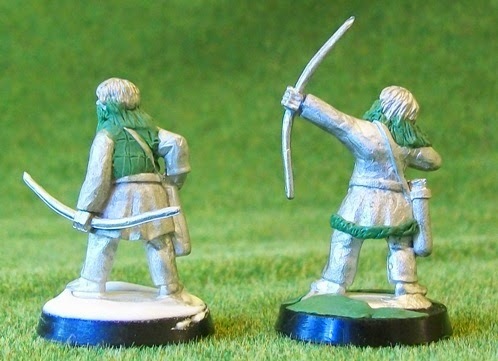 For most of my life, the only real limiting factor to buying miniatures has been the price. When I was young, that was enough to stop my miniature buying from ever getting out of hand; however, as I have gotten older and made a bit more money, this became much less of a limiting factor. 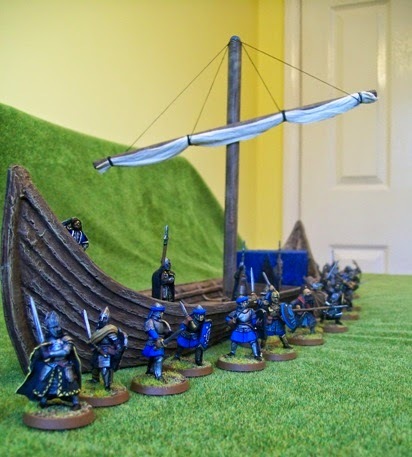 As a hobby, miniatures are relatively inexpensive and it is easy enough to accumulate huge numbers of them without spending huge amounts of cash. Some might consider that a good thing; I do not. 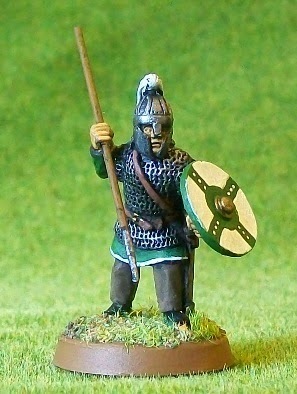 Over the last forty-five days, I have painted 8 miniatures, and I have bought none. 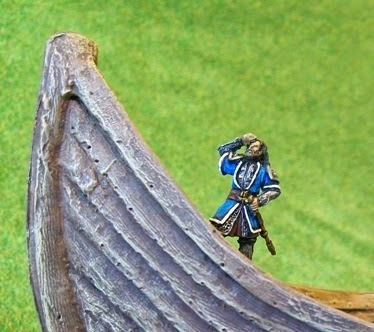 In that time, there have been plenty of miniatures, both new and old, that have tempted me. In most cases, the actual monetary cost of those miniatures was not high, and I would have likely bought them in a moment of excitement (or just as likely, in a moment of boredom). With the pledge, I have another consideration to take into account – each of those figures would cost me two hours. Two hours is about how long it takes me to paint an average miniature. I don’t begrudge this time; I enjoy it. But now I know that every miniature I buy means two more hours of painting time before I can buy another one, and that is something that has to be considered carefully. I think that is the true power of 'The Pledge'. Not that it fixes a specific limit on miniature buying, but that it forces a re-examination of the full cost of those purchases. 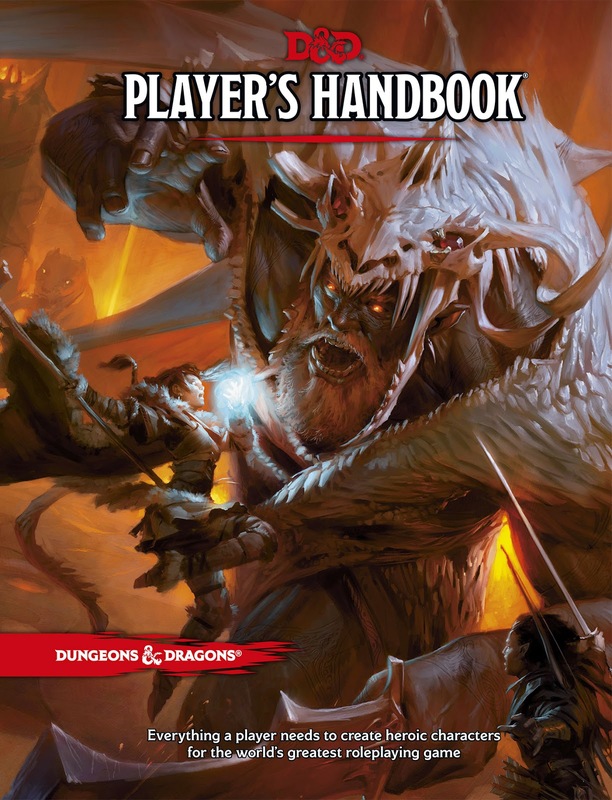 Over the last few months there has been a lot of excitement in some parts of the nerdosphere about the release of the new edition of Dungeons & Dragons. 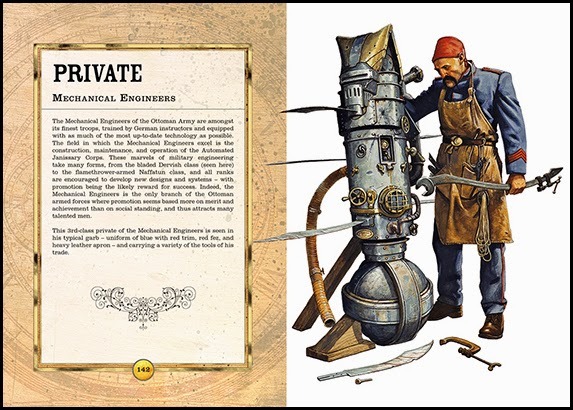 Old pros call it 5th Edition (or 5e), but Wizards of the Coast, who are producing the new books, simply call it Dungeons & Dragons without any numerical designation. Now, I haven’t really played D&D in a couple of decades, but I have watched with interest from the sidelines as various incarnations of the game have come and gone. I grew up with AD&D (1e), thought 2nd edition was terrible, marvelled at the sheer scope and breadth of 3rd edition, and finally mourned when 4th edition wrecked it. Probably the most interesting point in the history of Dungeons & Dragons came in 2009, right about the time 4th edition was released. It was then that a schism developed among the D&D players. 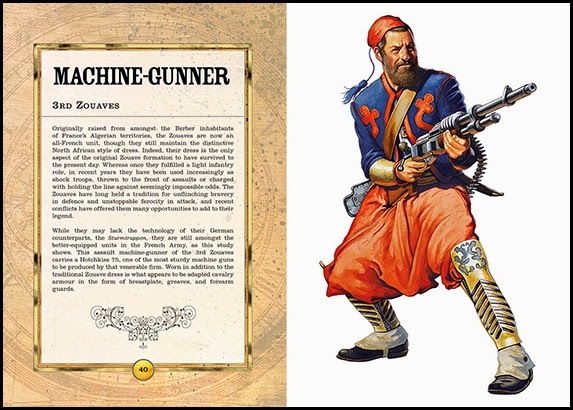 Some carried on to the new edition, but most turned instead to a new game called Pathfinder. In one of the great marketing backfires of all time, WOTC had created a situation where another company was able to come in and essentially repackage Dungeons & Dragons 3e under a different name. That name was Pathfinder, and it quickly rose to become the most popular role-playing game of them all, slowly pushing aside D&D 4e. I’m sure that’s all pretty confusing to those who didn’t watch it happen. Is it really just the name, Dungeons & Dragons? Is it the association with many ill-spent college nights rolling dice and eating pizza? 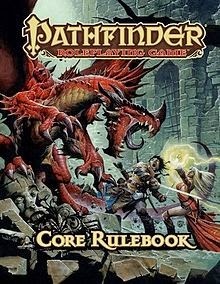 Why do people care if their game is called Pathfinder or D&D? Surely it only matters which game is better? Why do I, who haven’t thrown rpg dice in anger since D&D books were printed in black and white also feel the call? I have two books coming out this year, and the first one is just about to hit the shelves. That might surprise some people since the book is The Story of Santa Claus. 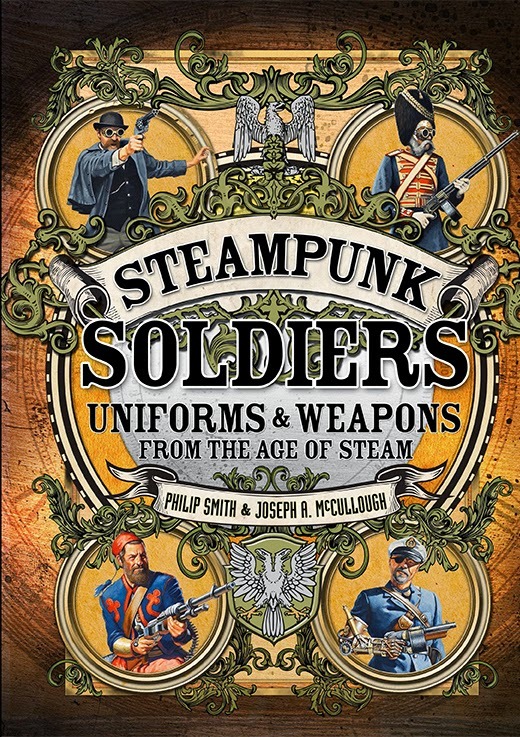 Well, as it turns out, if you want a book to be a part of the Christmas rush, it is best if it is released in September. Before everyone gets up in arms about Christmas books coming out before Halloween (or even the month that includes Halloween), apparently this has more to do with supply chains and such than it does getting the books on shelves this early. Regardless, I think I’m entitled to be excited and to encourage everyone to start their Christmas shopping (extra) early! I have written books for various reasons, usually for fun or money (or both), but I wrote this one specifically because I wanted to learn more about the subject. I knew a bit about Santa. I could name all of his reindeer. I knew he was originally a bishop named Nicholas and... well, that was about it really. So I set off on an academic journey to figure out the true story of Santa Claus, starting with the tales of St. Nicholas and doing my best to follow his development into the fat, jolly elf of today. On the way, I had to read some heavy texts; I even had to ask my bother-in-law to translate a work from ancient Greek. It was interesting, but difficult. In the end, I took all that I had learned and tried to write it in a fun, family friendly narrative, that focused on the magical stories that led to our modern interpretation of Santa Claus. 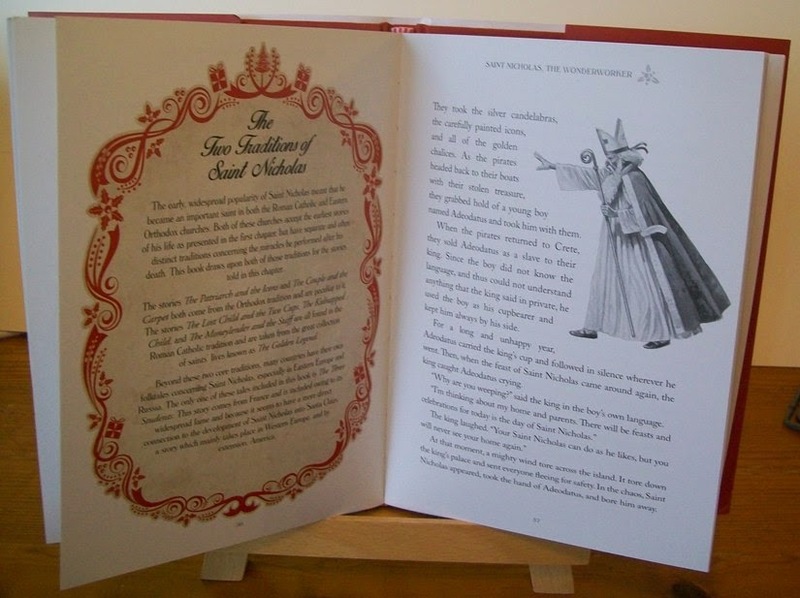 It includes the early stories of St. Nicholas’s life, such as his early gift giving, his appointment as a ‘boy bishop’ and his rescue of the three Roman generals. It then shares some of the great stories of his appearances after his death, where he time and again comes to the aid of children. From there it moves through the confusing years of the Reformation, the rise of other strange Christmas spirits such as Krampus, and the different faces of St. Nicholas, including Father Christmas and Sinterklaas. Finally, the book ends in America, where St. Nicholas takes on his modern form, thanks to writers and artists such as Washington Irving, Clement Clark Moore, and Thomas Nast. It’s all true, in its own way. Throughout the book, I scattered little asides, explaining St. Nicholas’s supposed actions at the Council of Nicaea, his relationship to the Norse god Odin, and the extent to which Coca-Cola actually factors into his story. It was my hope to bring a little bit of magic and truth back to the character of Santa Claus that I think has been lost in the last hundred years or so. 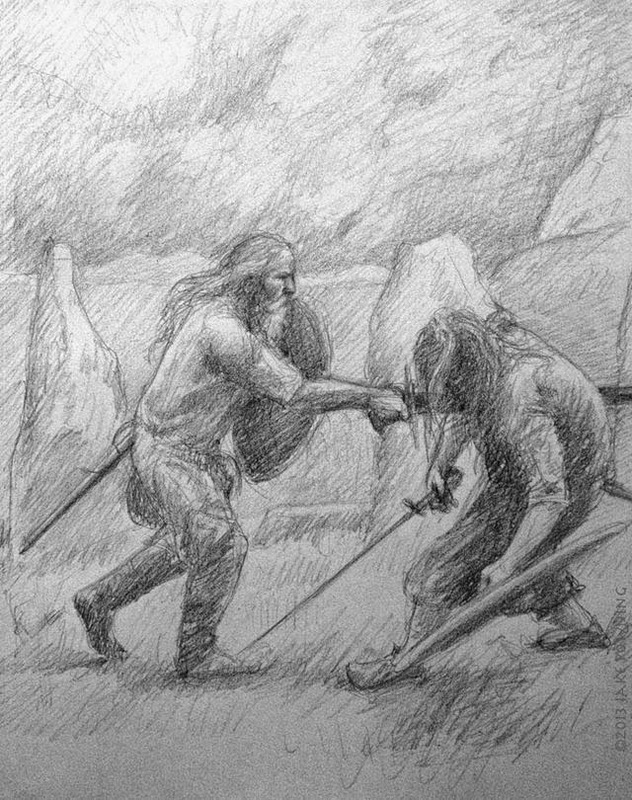 In this, I was greatly aided by Peter Dennis, who provided all of the illustrations for the book, both black and white pencil drawings and several full-colour paintings. 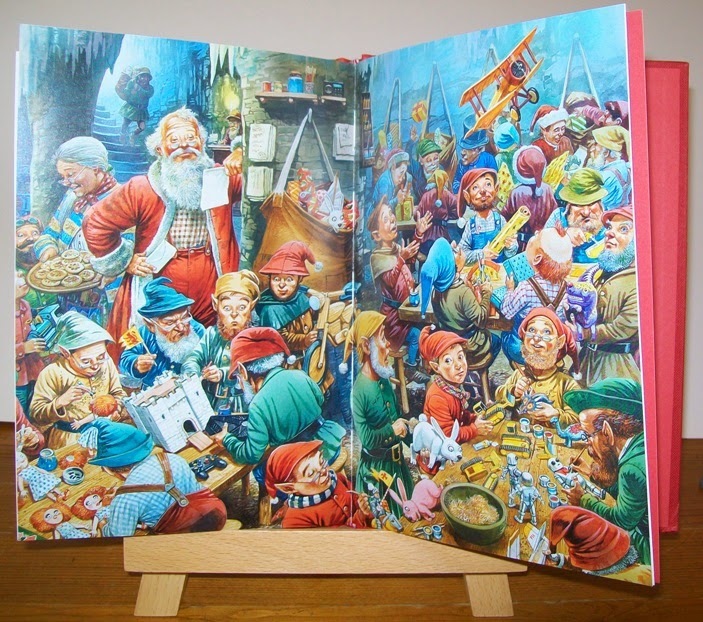 So, if you know anyone that might need a bit more Christmas magic in their lives, might I suggest helping them discover The Story of Santa Claus? You can pre-order it from Amazon in the US here. Or from Amazon in the UK here. The Dalek saucers tore through the Alliance fleet, suffering little damage, but leaving a trail of shattered and lifeless human vessels. 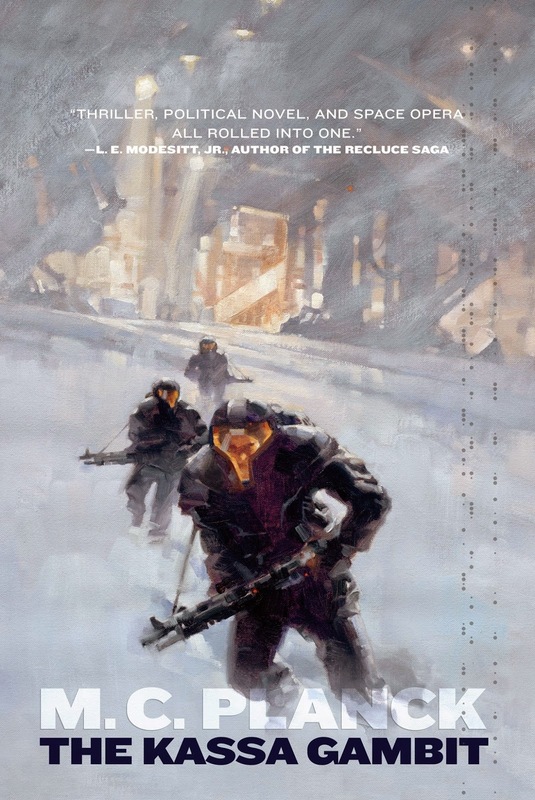 In less than two hours, they would reach the planet Harkon II, where their planet killer warheads would exterminate the world's two billion inhabitants. Although a mass evacuation was underway, it was too little, too late. Still, every minute meant another ship that could escape the destruction, another hold full of innocent civilians flown to safety. The Alliance's last hope rested with a team of eight marines who had successfully boarded the Dalek mothership during the battle. If they could work their way down to the power core, they might just cripple the ship, causing a massive delay in the Dalek assault. Millions would be saved. In the chaos of the brief space battle, the marine boarding pod had gone undetected as it latched on the Dalek ship. It took several minutes to cut through the ship's outer hull, but soon the marines dropped inside. Using their suit's scanners to detect the strongest power readings, they made their way through the dark, lifeless corridors. The only sound was their heavy breathing and the clank of their boots on the metal floor. Then, around the corner, stepped a roboman, one the Dalek's lifeless, human warriors. The marines quickly gunned him down, but more followed. 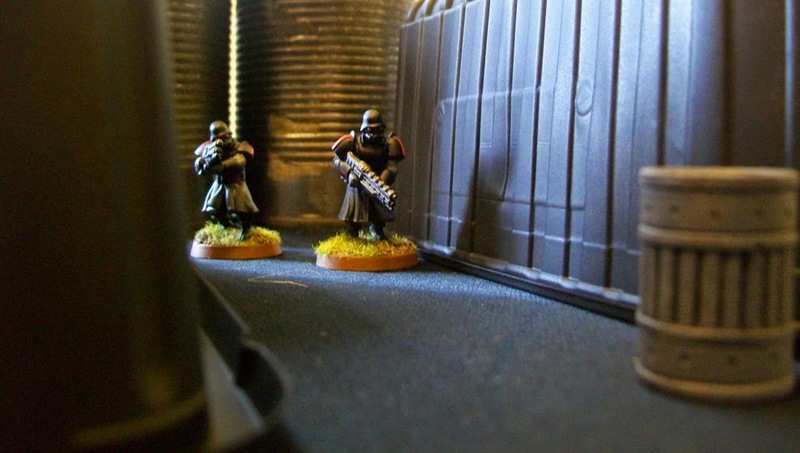 A vicious firefight irrupted in the tight corridors of the ship. 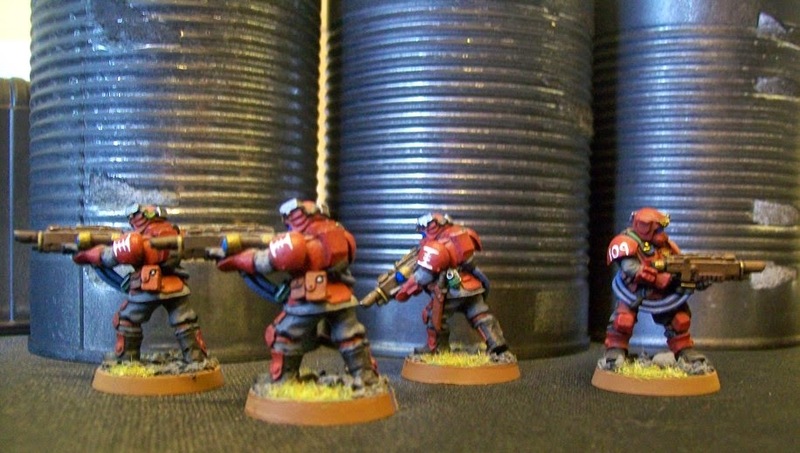 The marines' superior firepower, mowed down the robomen, but they just kept coming in what seemed like endless waves. Laser blasts sizzled down dark corridors, blasting through armour and human flesh. A marine fell, and then another, but slowly the survivors advanced, stepping over the still smoking bodies of friends and enemies alike. 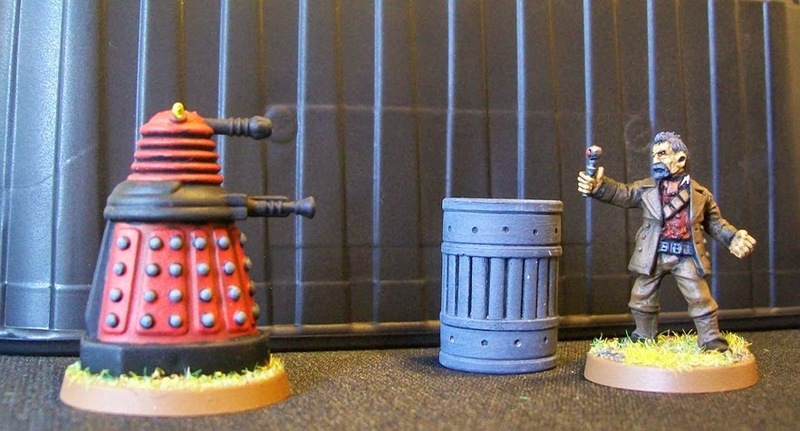 As the marines closed in on the power core, a pair of Dalek's rolled around the corner. 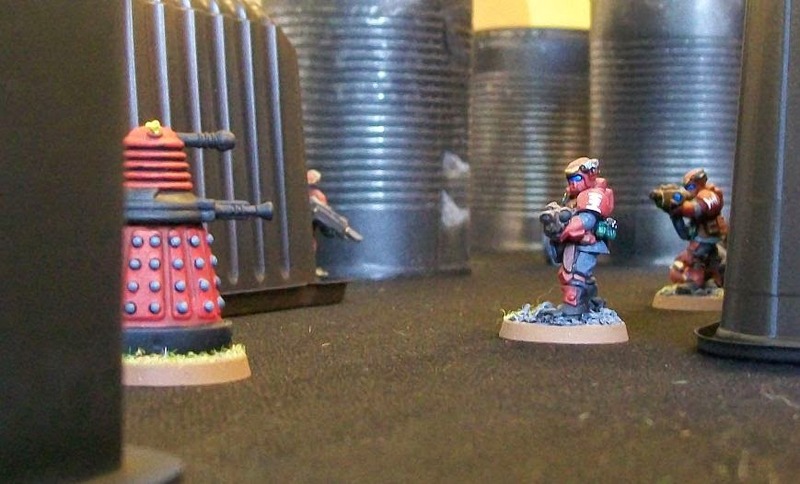 In seconds, three marines had been cut down, their armour no defense against a Dalek death ray. With only three men remaining, it appear the battle was over. But, just when all was darkest, there was strange sound, a groaning and wheezing. Out of nowhere, a blue box materialized, and an old man, in a battered leather jacket stepped out. The old man drew a small metal tool from his bandoleer and pointed it at the Daleks. The tool gave a high pitch whine, which seemed to confuse the Daleks. They spun around in circles, screaming gibberish. Inspired by the latest episode of Doctor Who, I set up this quick little game, just to have fun and take a few snaps. All of the wall were made quickly by taking last week's recycling and spray painting it black, it's all just cans and plastic food containers along with a few hirst arts barrels. While it is not my intention to review every episode of the Doctor Who season, I thought it only fair to say a few words about this week's episode. 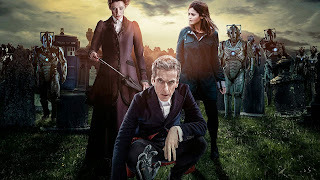 After my lukewarm review of the season opener, I am happy to say, Doctor Who came back strong this past weekend, presenting one of the best episodes of the past few seasons, and arguably one of the best since the show's revival. 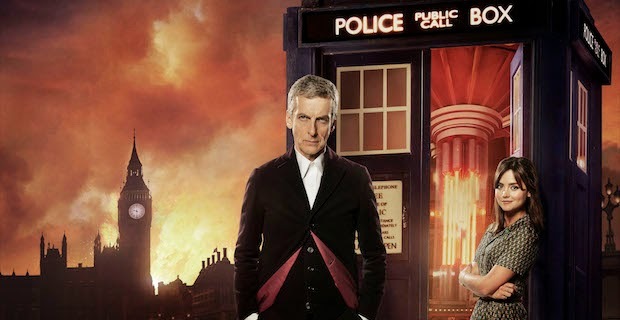 Having left the silliness of dinosaurs and lizard-women in Victorian London behind, the Doctor once again travels into space to take on his greatest enemy, the Daleks.While the Daleks have definitely been overused in the last decade, this is a story that could not function without them. I am happy to report that Peter Capaldi truly shines as the Doctors in this episode. Although he is still gruff, and at one point seems somewhat callous, it is all part of the greater exploration of his character that is the focus of the story. 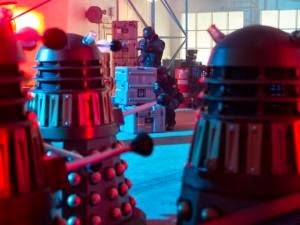 A story that is presented in a fantastic, action-packed package, that includes a huge shoot-out between a squad of Daleks and human 'rebels'. Dalek's explode, human's are zapped, flames spew in all directions. This is classic Doctor Who, but with a budget the original series could only dream about. Not every note was pitch perfect, there is a real dud moment when the 'over arching plot line' is badly integrated and detracts from the terrifically building tension, but this is overshadowed by the generally terrific dialogue and really nifty sets. If even half of the episodes of this season are this good, or even close, it will be a strong season of Doctor Who indeed. 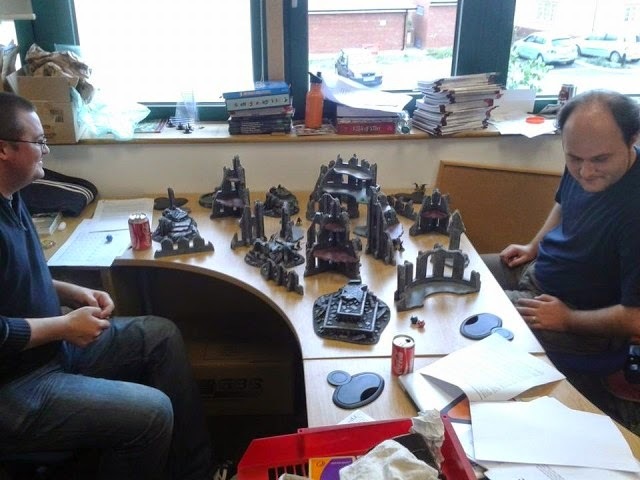 I finally had a chance to sit down and have a game of Frostgrave with Phil Smith, the Games Manager at Osprey Publishing. You can read his full write-up of the game here. Basically, I got trounced. I got off a few good spells early, including a poison dart against his apprentice, but then a lucky bow-shot took down my wizard. That left my poor, outnumbered apprentice to fend for herself before a crossbow bolt took her down as well. Well, at least they had a good time. Just because I wrote the game doesn't mean I'm good at playing it! 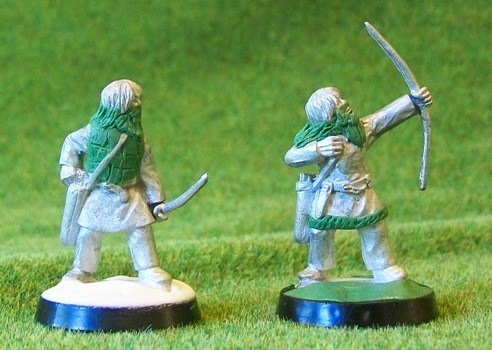 Hopefully, there will be some more exiting news coming out about Frostgrave soon.